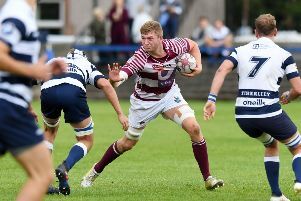 Graham Wilson goes into action for Heriot’s at home to Edinburgh Accies in the BT rugby Premiership tomorrow just a try away from another milestone in what is already a landmark season. Scrum-half Wilson stands on 1195 points for the club he joined straight from Dollar Academy and if things are going well on the personal front, then success is proving infectious throughout the Heriot’s club. Not only did the first team hit the top with an away win at Stirling County last weekend, but the seconds are leading the National Reserve League and the thirds have a perfect ten out of ten in the East Reserve League Division Two. It is the firsts who are the showcase for the club and recognition by the Barbarians is not easily obtained. “I was particularly delighted to get a call as my late grandfather, Ken Wilson, as well as gaining a cap for Scotland played for the Barbarians. First, though, comes the clash with Accies and although the length of the league separates the sides, Wilson has good reason to be wary. He said: “We just edged Accies out 28-26 earlier this season and we will need to go on proving we can adapt to any conditions, which is another secret of what success we have had so far. If opportunities come then Wilson will take kicking opportunities in his stride, although he does not expect points to flow as they did on his first outing for Heriot’s. Tomorrow Keith Buchan makes a welcome return from injury to the back-line where Stuart Edwards is out after undergoing an appendix operation following the win at Stirling. Gavin Cameron is promoted at prop. Accies welcome back prop Alex Allan for the first time since he was capped by Scotland out of Glasgow during the summer. It’s derby day at Malleny Park where hosts Currie await Boroughmuir with half-backs Richard Snedden and Joe Reynolds back from injury. Also, Peter Murchie and Mike Cusack have been released by Glasgow to play. Boroughmuir give a first start of the season to Craig Marshall at centre, while the only change to the pack has Trent Sutton reinstated at second row.